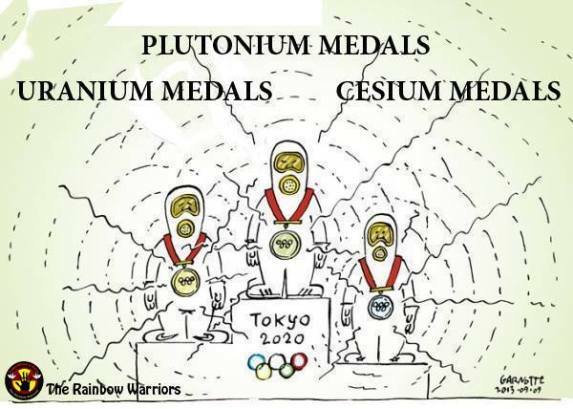 Atomic Balm Part 1: Prime Minister Abe Uses The Tokyo Olympics As Snake Oil Cure For The Fukushima Daiichi Nuclear Meltdowns March 01, 2019, Fairewinds Energy Education, By Arnie Gundersen “……….To determine whether or not Olympic athletes might be affected by fallout emanating from the disaster site, Dr. Marco Kaltofen and I were sponsored by Fairewinds Energy Education to look at Olympic venues during the fall of 2017.We took simple dirt and dust samples along the Olympic torch route as well as inside Fukushima’s Olympic stadium and as far away as Tokyo. When the Olympic torch route and Olympic stadium samples were tested, we found samples of dirt in Fukushima’s Olympic Baseball Stadium that were highly radioactive, registering 6,000 Bq/kg of Cesium, which is 3,000 times more radioactive than dirt in the US. We also found that simple parking lot radiation levels were 50-times higher there than here in the US. With the upcoming XXXII Olympiad in 2020 hosted by Japan, it is necessary to look into the radioactivity of Olympic venues as well as tourist attractions in the host cities… Since thousands of athletes and millions of visitors are travelling to Japan for the Olympics, there has been widespread concern from the international community about radiation exposure. Therefore, it is important to investigate the extent of radioactive fallout from the Fukushima Dai-ichi incident. The measured results showed a much higher activity of Cesium-137 in the proposed torch route compared to other areas. Overall, the further away from the Fukushima Dai-ichi Nuclear Power Plant, the lower the radioactivity. The activity of Cesium-137 in Tokyo, the furthest site from the plant, was the lowest when compared to the other sites. Therefore, the activity of Cesium-137 in Tokyo sample was used as the baseline to qualitatively estimate the human exposure to radiation. At the Azuma Sports Park, the soil and dust samples yielded a range of 78.1 Bq/kg to 6176.0 Bq/kg. This particular Olympic venue is around 90 km from the Nuclear Power Plant. The other sites that are closer to the Nuclear Power Plant like the tourist route, proposed torch route, and non-Olympic samples have higher amounts due to the close proximity to ground zero of the disaster.